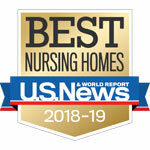 The Timbers of Cass County has been awarded US News and World Report 2018-2019 best Nursing Home designation. 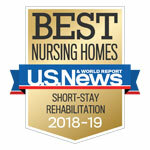 Only 19% of U.S. nursing homes have earned this honor. Click the award icon to learn more about this award. Situated near inland lakes and rolling farmlands, a Victorian charm surrounds the citizens of Dowagiac. This vibrant and historic city offers all the amenities of a large city while maintaining its small town warmth and appeal. Dowagiac’s commitment to heritage makes it a wonderful location for The Timbers of Cass County. Our staff members embrace a special quality of life as they provide thoughtful and exceptional healthcare services to our residents in a safe, clean and friendly environment. With stone finishes and timbers incorporated through its exterior, the residence of The Timbers of Cass County resembles a grand lodge. The Timbers is a 108-bed community offering 20 private rooms and 44 shared accommodations. Along with four different resident room options, our community has two dining rooms offering restaurant-style dining, three therapy rooms and three day rooms. Beautifully decorated living rooms, a beauty and barber shop, activity and recreational rooms, a library and courtyard are also located within our community. Our staff members are proud that our community serves as our residents’ home as well as a gathering place for family and friends. Private dining areas are also available for these special visits. The Timbers of Cass offers a wide array of personalized programs based on each resident’s interests and hobbies and spiritual and emotional needs. Activities may include involvement with a Women’s Club or Men’s Club, shopping days, ice cream socials, arts and crafts, and gardening. For our residents who are on the go, outings to community events and local points of interest are often planned. Our staff members as well as volunteers are happy to laugh with and share new experiences with our residents. These activities and daily interactions help our quality culture thrive. The Timbers of Cass is a dually certified community offering skilled nursing and rehabilitation services. Our talented nursing staff provides wound care, intravenous therapy, dialysis care, and hospice care. And, our in-house physical, speech, occupational therapists treat both short-term intensive and long-term extensive care residents. Our services help restore the quality of life to our residents and enable them to reach the highest level of independence possible.